Official EPS page on the NHS Digital website. EPS compliance specifications on Health Developer Network. Learning article Electronic Prescription Service (EPS) integration walk through. The Electronic Prescription Service (EPS) is a national system implemented within Spine infrastructure. The EPS manages the dispensing of electronic prescriptions and the onward transmission to the NHS Business Services Authority (NHSBSA). The NHSBSA provides the prescription reimbursement and cost reporting function for the NHS. The scope of the EPS includes all prescriptions from General Practice and Urgent Care, including those prescribed by the NHS111 service. In theory, all prescriptions that are reimbursed by the NHSBSA are in scope for the EPS. The scope of dispensers includes community pharmacies, distance dispensers, dispensing appliance contractors and dispensing doctors. Medication item listed within the NHS Dictionary of Medicines and Devices (dm+d) can be prescribed via the EPS except for those listed within Controlled Drugs Schedule 1. Any patient with an NHS Number can receive an electronic prescription. Patient consent is implied meaning a patient who does not want to receive an electronic prescription must inform their prescriber. The EPS is a distributed system. The Spine component primarily acts as a Message Broker connecting prescribing, dispensing and reimbursement systems. There is also a Portal application, the EPS Prescription Tracker, that supports end users and service management teams if there is a need to confirm the existence of an electronic prescription. Functionality within prescribing and dispensing systems is based on a functional specification (link provided at top). The only client software component provided by NHS Digital is the Identity Agent as part of the end-user smart card authentication process. These systems communicate with the EPS Spine component via an ebXML / HL7v3 external interface. Interoperability between the EPS Spine component and NHSBSA reimbursement systems is via a WebSphere MQ / HL7v3 interface, with the NHSBSA acting as the MQ server and Spine acting as the MQ client. The Spine infrastructure sits on the N3 network. NHS organisations either have their own N3 service or have a networking route through to N3 via a 3rd party network provider, known as an “N3 Aggregator”. The NHS Choices service and it’s SOAP / XML web services provide the definitive list of EPS-enabled dispensers in England. Both prescribing and dispensing systems use these web services to help patients choose a “nominated dispenser”. The Basho Riak noSQL database is the underlying technology of the EPS Spine component. The EPS Spine component is a transitory store of prescription data; The EPS does not include a residual store of prescription data. The NHSBSA are responsible for long term storage of prescribing and dispensing data. The EPS only holds prescription data for those prescriptions still in the dispensing process. Various data cleaning jobs purge old data from the system. This design ensures data storage requirements are manageable (albeit still enormous) and cost effective. The service must handle volumes of over 1 million transactions per day, with peak periods during and directly after GP surgery hours; A clever combination of low footprint open source technologies means the EPS can handle peak loads, with negligible impact to service response times, on minimal hardware. The EPS Spine component is highly resilient and both vertically and horizontally scaleable. Electronic prescriptions will be signed with an Advanced Electronic Signature (AES); An advanced electronic signature, as defined within UK healthcare law, is applied to every electronic prescription. The hash contains the data elements required by law for a prescription. The signer’s certificate is taken from their NHS authentication smart card. Dispensing systems validate the signature contained within the electronic prescription on receipt and before any dispensing processes can occur. Each prescription will be identified by a bespoke Prescription ID throughout the prescribing, dispensing and reimbursement life cycle; An 18-character Prescription ID, based on an algorithm defined within the EPS compliance specifications, uniquely identifies the prescription during it’s life cycle. The ID is not designed to be universally unique, as does not need to be. It has been designed to be sufficiently unique for the purposes of the EPS and not overly large so can be relayed verbally if/when required. The ID is represented as a 1D barcode on a prescription token that may accompany the electronic prescription. See also a learning article for EPS identifiers and what they mean. Patients are identified by NHS Number; By law, a prescription must also contain other patient demographics including the patient’s name and address. Implementation will be phased. Initially only patients who have chosen a “nominated dispenser” will receive electronic prescriptions; A phased approach allowed the gradual deployment of compliant EPS systems and end-user training. Only those patient’s who have nominated their preferred dispenser receive electronic prescriptions. Dispensing sites confirmed as live are added to NHS Choices. Only dispensers listed by NHS Choices as EPS-compliant can be nominated. The the final phase of EPS implementation is due soon. Here, all prescriptions, by default, will be electronic. A patient, can of course, request a paper prescription from their prescriber. Patients can continue to use a nominated dispenser but can also receive an ‘electronic token’ via email or a mobile device App. Then present this token to any pharmacy for dispensing, e.g. scan a bar code within an email or on-screen within an App. The prescription container will include one or more prescribed medication items, but initially limited to four items; A limit of up to four medication items per prescription is in place to mirror the physical constraints of paper prescriptions. This (artificial) limit still applies on electronic prescriptions. A prescription cannot be split and dispensed by multiple dispensers; A prescription must be ‘completed’ by a single dispenser before submitted for reimbursement. Items are marked as ‘Dispensed’, ‘Not Dispensed’ or ‘Cancelled’ to put them into a completed state. The NHSBSA can only pay one dispenser for one prescription. Prescribers and dispensers will be smart card authenticated and systems will implement Role Based Access Control (RBAC) onto local functionality related to the prescribing or dispensing process; The use of smart cards is integral to the electronic signing process, so mandatory for prescribers. All EPS end users authenticate using the NHS smart card. Systems implement RBAC to control access to local functionality. This includes functionality like the ability to view medicines data, request the cancellation of a prescription, record dispensing information against a prescription and submit endorsement information required for the prescription reimbursement process managed by the NHSBSA. The primary interface to talk to the EPS, for the creation of electronic prescriptions, their download for dispensing and the subsequent financial claim process is via an ebXML/HL7v3 messaging interface implemented via the Spine Transaction Messaging Service (TMS). The messaging specification is available on this website and is currently MIM 4.2.00. There’s no escaping the fact that the ebXML/HL7v3 interface is complex. The accompanying functional EPS requirements were written to supplement the HL7v3 specification but soon grew to include lots of business process rules. Why so complex? 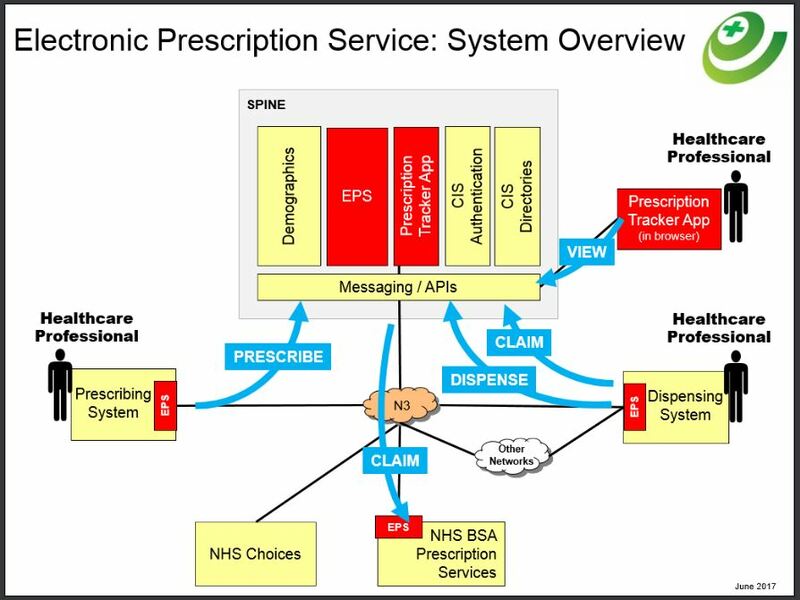 Well primary care prescribing and dispensing is very complex. The paper processes evolved over many years with now various ways to prescribe. Much of the complexity has derives from inherent issues of paper prescriptions. The primary rule enforced by the EPS is to prevent two or more dispensers accessing the same electronic prescription. This adds complexity into a system that must also allow patient choice to use any NHS dispenser in the country. A Prescription Tracker API has been available since July 2016. This provides programmatic access to the same EPS data visible within Prescription Tracker portal application. A blog about the API’s potential use cases has been published on the Health Developer Network together with the API technical documentation. There are no current plans to make available a RESTful API to mirror the ebXML/HL7v3 interface. 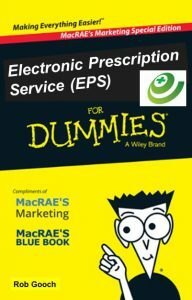 Now read EPS For Dummies Part II: A deeper look.